As the communications industry barrels toward major new technologies like 5G, massive IoT, and cloud everywhere, there is one mega-trend that connects them all: the move to intelligent software-based network automation. Without intelligent automation, networks that are already overwhelmed with the needs of today’s connected world stand absolutely no chance of scaling to customers’ demands of tomorrow. Service providers must adapt. They must undergo a digital transformation that allows them to break free of the manual, legacy business processes that shackle their ability to transform and innovate. It is with this challenge in mind that that we’ve taken the next evolutionary step with Blue Planet, creating a more independent division that is separate from Ciena’s primary hardware equipment business. The public-facing changes you notice may seem minor – such as a change to our Blue Planet logo and branding – but the underlying transformation to our organization and structure give weight to the significant focus we place on using intelligent automation to transform our customers’ businesses. In order to digitally transform, service providers must optimize their critical business processes, which span IT and network functions. At the heart of the problem is that many of these key functions operate in silos, often with IT operating based on static and fragmented network information. Today’s announcement is the latest step in a journey we’ve been taking with our customers for many years – a journey that illustrates the evolution in how our customers think about network automation. Back in 2015, when Blue Planet was acquired by Ciena, the industry was introduced to the concept of software-defined networking (SDN). Conversations with service providers about software automation were narrowly focused around how orchestration could enable faster turn-up of services across multi-vendor networks. But our customers today face bigger challenges. In order to digitally transform, service providers must optimize their critical business processes, which span IT and network functions. At the heart of the problem is that many of these key functions operate in silos, often with IT operating based on static and fragmented network information. An automation approach is needed that brings IT and network together, seamlessly aligning these functions across the providers’ critical business processes. And so last year, our Blue Planet team set out to create a more holistic approach to automation. We acquired Packet Design to bring layer 3 route optimization and assurance capabilities into the software suite. We then acquired DonRiver to enable unified OSS inventory federation. And we are evolving our Blue Planet Analytics to provide deep insights to optimize network and IT performance. The result is a holistic approach to closed-loop automation that is unique in our industry by leveraging analytics, multi-domain orchestration, federated inventory management, and route optimization and assurance to achieve intelligent automation and close the gap between IT and the network. 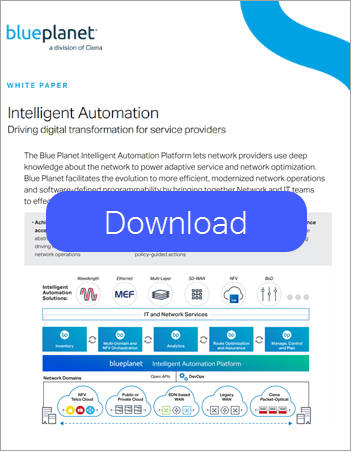 Blue Planet’s holistic approach to closed-loop automation allows service providers to leverage a dynamic view of network and service resources to derive business insights that shape network control policies and inform IT systems with real-time information. The awareness of network state and analysis of performance data triggers policy-guided actions back into the programmable network, optimizing network planning, service fulfillment, and assurance. This open, data-driven approach optimally aligns and accelerates mission-critical business processes that span the network and IT to deliver faster time to revenue, reduced costs, and ultimately a better customer experience. But it’s not just about a new set of tools that will make this move to intelligent automation possible. Every network is different. Every customer I talk to has their own history and challenges that are built into their unique processes, and even the culture of their business. This ethos within each service provider is not to be taken lightly, as many times it is the difference between success and failure in a digital transformation. And failure is not an option. As I recently pointed out in an interview with TM Forum, this transformation is a must-do or don’t-survive tipping point. Historically, much of the focus within service providers has been around technological innovation. The challenge today isn't about technology; it’s a business-model challenge. How are service providers going to continue to monetize what they deliver to the world, differently, given how people are consuming their services today? It's a fundamental business model shift, and the cemeteries of business are filled with the logos of companies that didn't know how to make the switch. Our Blue Planet team aims to help. For more on our vision around the future of intelligent software-based network automation, read our Intelligent Automation White Paper. 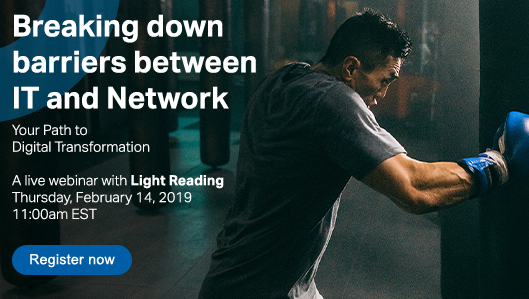 I also invite you to join Kailem Anderson, VP of Blue Planet Product Management and R&D, on Feb 14 for a live discussion on this topic and how to help your IT and network operations come together.